The purpose of this section is to encourage one to get on HF. Once on HF, most Hams will eventually commence to chase DX (foreign countries and entities). There is a universe of opinion about how to operate DX and “snag” the new one; a lot of this is mine. There are plenty of countries and entities to work even though we are moving toward the sun-spot minima. 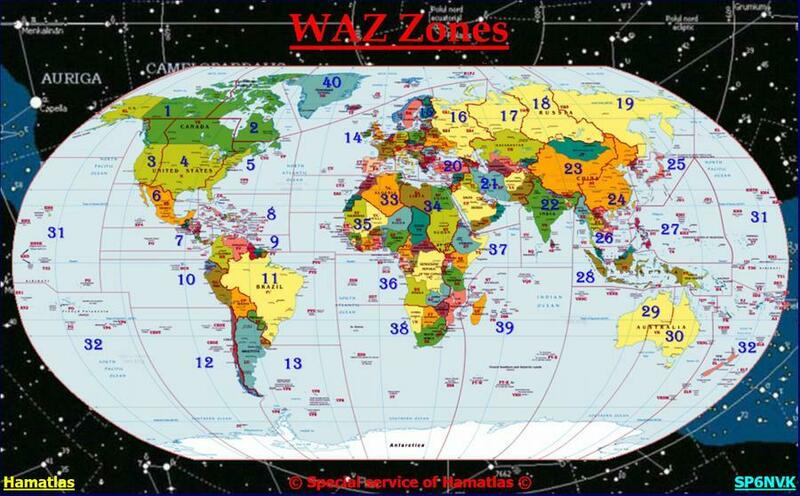 Europe, Africa, South America, Pacific and Asia should provide plenty of “count” toward DXCC and WAZ. Mid-East, India, and Indian Ocean a bit tougher since the signal path will pass over or near the North Pole. Best conditions occur when K is low. High K indicates a large aurora around the north (and south) pole(s). Every ham needs a fundamental library. All sources here are to be found at www.arrl.org/arrl-store, and all are relatively expensive, so start your library with the ARRL Operating Manual for a complete "how to" overview of the hobby. The next choice would be the ARRL Handbook, then the ARRL Antenna Manual. After that, specialty manuals that fit with your specific interest. My choice is ON1UN's Low Band Dxing which has a lot of useful information about operating on 80 and 160 meters. A good place to begin with HF radio is to understand propagation. The National Bureau of Standards radio stations WWV and WWBH announce the K and A Indexes at :18 and :46 past each hour respectively as part of the "time tic." Frequencies are 2.5, 5, 10, 15, and 20 mHz. Hearing the announcements on WWBH in Hawaii will give you a good idea about propagation into the Pacific region. But what do the K and A indexes mean? They quantify past geomagnetic activity. You can read more about this in the ARRL Handbook, but as a general rule, the lower the value, the better the propagation. The Operating Manual contains a detailed description about what to expect on each of the HF bands. The display below is live, current data from http://www.hamqsl.com/solar.html. Click on the link to see other neat stuff. One can immediately see which bands are currently good and which are not so good. So, here is a first indication of where to listen. 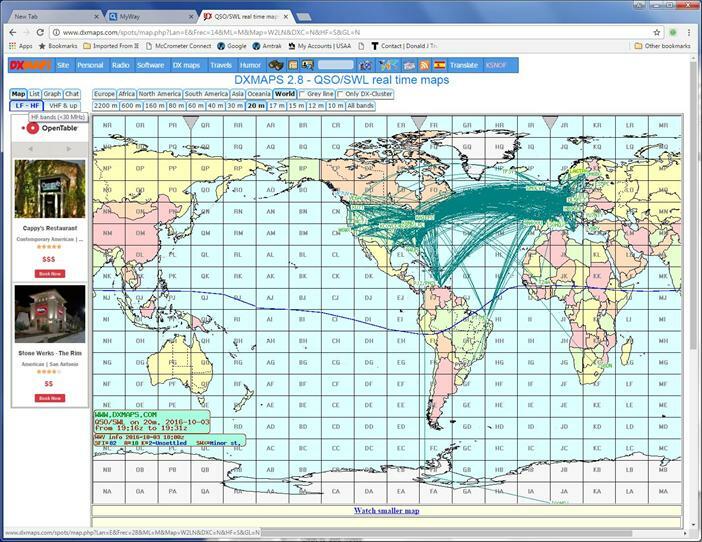 Next, look at www.dxmaps.com for a band by band depiction of what is going on. The graphic shown below is for 20 meters a few months ago. Click across the frequency tags at the top of the map to quickly see where the activity is located. ARRL publishes a weekly bulletin showing those DX operations expected for the coming week. Every member should receive this bulletin. If not, log-in to ARRL and check your account. At the bottom, be sure your email address is entered and then check the box saying OPT IN. With this you will extablish an alias to use for email if you do not wish to use your personal address. it will be <yourcall@arrl.net>. Check this bulletin. There is plenty of DX on the air even though we are moving into the sun-spot minima. A running summary of Announced DX Operations is published daily. See http://www.ng3k.com/misc/adxo.htm for this excellent product showing what you can expect well into next year and beyond. Expect any rare DX to use split operation. QSX (receive frequency) for CW is generally UP 1.5 to 10 kHz above the sending frequency. QSX for SSB is generally UP 5 to 10 kHz above sending frequency but can be even further up the band. While this is the general rule, Heard Island (VK0) listened down to avoid interfering with the operation at Comoros Island (D6) on at the same time. In any case, the DX will generally announce where they are listening and will normally publish a band plan on their web page. You need to know your radio and how to use the "quick split" function to quickly get on their listening frequency. Best practice -- Visit the Expedition web page to read how they expect to operate. Above all, listen to what the DX says. Many consider the DX Century Club (DXCC) operating award to be the premier award in Amateur Radio. The first DXCC certificates were awarded by the ARRL in 1937. It is earned by making contacts with at least 100 geographic locations around the world. Most of these are distinct countries but some are "entities." For example, Gibraltar (ZB) is a geographically separated British possession and counts for DXCC as an entity. Another example: Hawaii (KH6) is an U.S. State but counts for DXCC as an entity due to geographic separation. Currently, there are 340 entities on the ARRL DXCC list, which grows and contracts as geographic entities change around the World. Work only 100 of these, obtain confirmation by card or LoTW and you will earn your basic DXCC certificate. See http://www.arrl.org/dxcc for more information. But DXCC is not the oldest amateur radio operation award. Worked all Zones (WAZ) award began in 1934. The award is earned by working and receiving confirmation from amateurs located in 40 geographic zones of the world as defined by CQ Amateur Radio. The basic award is for making contact using any combination of amateur radio bands and modes. RTTY, SSB and/or CW. Three major Fall contests are held each year: RTTY in September, one for SSB in October and the last for CW in November giving ample opportunity for Amateurs to work as many zones as possible during these weekends. See rules for WAZ here and the map below to gauge the degree of difficulty in obtaining this other premier operating award in Amateur Radio. Get on the air and work the various DX contests. If you working with low power, wait until the second day. At this point your QSO will be worth 100 or more points to the DX contester due to the “multiplier effect.” Start out with “search and pounce” and then toward the end of the period, go up the band a bit and try to run. Find out for yourself what works for you and what doesn’t. I will always send my full call sign. I will call and then listen for a reasonable interval. When the DX operator calls me, I will not repeat my call sign unless I think he has copied it incorrectly. I will be thankful if and when I do make a contact. I will respect my fellow hams and conduct myself so as to earn their respect.